Super Fun Day at the Lake! Before too long everyone was awake, fed and in their bathing suits. The kids were super excited but since we aren't really lake people, they had no idea at all what to expect. The dock was just down the road and there was plenty of room to play. After everyone was life jacketed up, the girls went out on the boat and the boys stayed back at the dock. At the dock, the kids used part of a boat slip to be a balance beam. There were 2 big kayaks and 1 little one along with a paddle board. They also had a huge floating water mattress thing and fishing poles to catch fish. When the girls arrived back, the boys left on their boating adventure. Robby went on the second run with the girls and I went on the second run with the boys. The McGuire girls loved speed when they were on the tube and couldn't get enough. 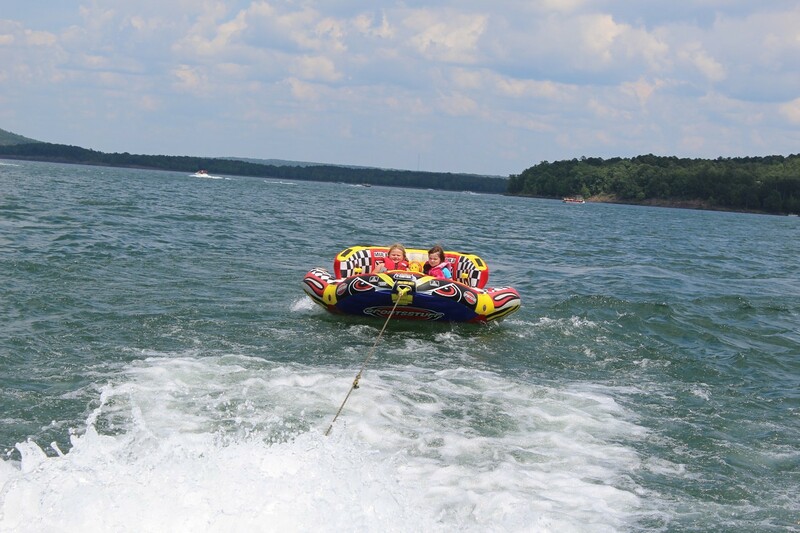 Reagan and Campbell managed to stay in and loved speeding through the water on the tube. Little Keaton just went on the tube the first trip. She rode with Laynie and I don't think that she was too crazy about the ride. Completely opposite of Keaton were the boys. They loved tubing and couldn't get enough. They never got tumped but I do believe that if they could have rode in the back of the tube all the way home tonight, they would have. There was a bit of a problem with the boat but it happened at lunch time, so Amber, April and I ran back to their house to pick up lunch. We had all of the sandwich fixings for lunch and brought them to the dock to eat. Everyone ate lunch and then it was round 2 for the boat. When everyone got back from the boat ride, we started packing up to head back to the house and then the Dennies started packing up to head back to our house. We had planned on staying for supper but realized that it would just be too late to pick up Whitman and get our people home, cleaned and into bed. After loading up, we drove home stopping only three times (compared to yesterday's 6 stops). Today's stops were for ice, gas and supper so they were all pretty quick stops and we were at Nonna's house to pick up Whitman by 9. Whitman had had a wonderful time and hang on to Nonna's leg for dear life so he wouldn't have to go home with us. Once we were home, he stayed in his car seat and told Reagan that Daddy was going to take him back to Nonna's house. That didn't happen because his momma put him into his bed! The kids rotated through the showers as Robby unloaded the car. We put everything up during their showers and soon everyone was happily resting in their beds. We all had a wonderful time and my people can not wait to go back.